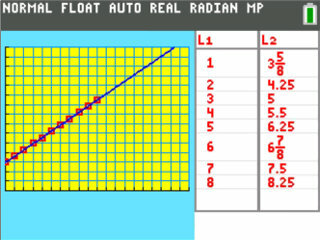 :: The Mode menu is nearly identical to the one on MathPrint TI-84 Plus calculators. Notably, you can still disable MathPrint by entering Classic mode. :: The Graph Format menu is greatly expanded. You can set grids of lines or points, plus specify the color of the grid. You can choose a picture for the background behind graphed functions. We also saw colors specified both as numbers (1 = light gray) and as names ("MEDGRAY"). :: Because the graph is higher-resolution, the Trace cursor now moves 4 pixels at a time by default instead of 1. You can set this in the new Window menu. :: You can put the List Editor side-by-side with the graph screen. It appears that this feature may have also been added to the monochrome MP operating system. Perhaps a new MP OS for the TI-84 Plus/SE is coming too? : Both the Catalog and error messages now display helpful hints, like the arguments and a blurb about using functions from the Catalog or more information about what may have caused the error message for errors. :: There's a new regression mode called QuickPlot & Fit-EQ That appears to let you draw points for regression directly on the graphscreen. We continue to be excited about this new calculator, and we're eagerly anticipating the flood of new users and programmers who will be coming to Cemetech (and the rest of the community) to learn to use their new TI-84 Plus C Silver Edition calculators. What are your thoughts on these new features? Tell us below! Left: A graph with a grid, a Stat Plot, and a line of best fit, split-scren with the List editor. 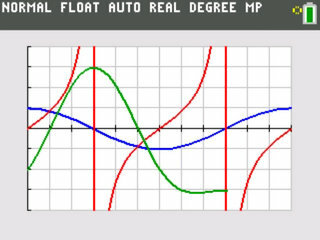 Right: Three graphed functions, demonstrated line colors, the grid, and asymptote detection. Ooh, this all looks fun! I'm especially liking the grid feature: that should make screenshots of graphs from this device much nicer (I use graph results from my 84 PSE in some of my homework assignments). And it should make it easier to estimate the (x,y) coordinates of points along the graph as well, which I'm sure TI would be quick to point out. I forgot to mention that there's a new run indicator, a yellow circle next to the battery meter that's not unlike the spinning run indicator on the Prizm. I like the colored lines, this will help with Algebra and knowing what line is what. Aye, it will certainly make graphing on graphing calculators more like using Matlab, Gnuplot, and all those great programs. it's actually good for MATH! Thank you TI! Have you ever delved into the Stats and Probability features on the TI-83/TI-84 Plus series? They're actually extremely thorough, which I'd say 99% of the calculators' users never discover. In fact, it was only while researching for my latest book that even I discovered some of them. Well, other than the obvious visualization advantages of color, what sort of things do you see this calculator being able to do better? And are you including things like plotting the normal distribution via DrawNorm and testing hypotheses using the Z-Test( function within the scope of your exploration? Well, the calculator has more features in the aspect of resolution and accuracy. Having the list editor beside the graph screen will be an enormous help with me, actually. When I'm without a PC, I can't really do much with the 84+ easily. The calculator looks to me to have more accessibility, and having different color graph representations will certainly help with a lot of the more difficult to follow functions. I'm actually hoping to port my Prizm 3D grapher, Graph3DP, from the Prizm to the TI-84 Plus C Silver. Assuming the EOS functions are still available, it will be much simpler, and hopefully a pure ASM port won't be that painful. There are 200 users online: 4 members and 196 guests. © Copyright 2000-2019 Cemetech & Christopher Mitchell :: Page Execution Time: 0.150708 seconds.